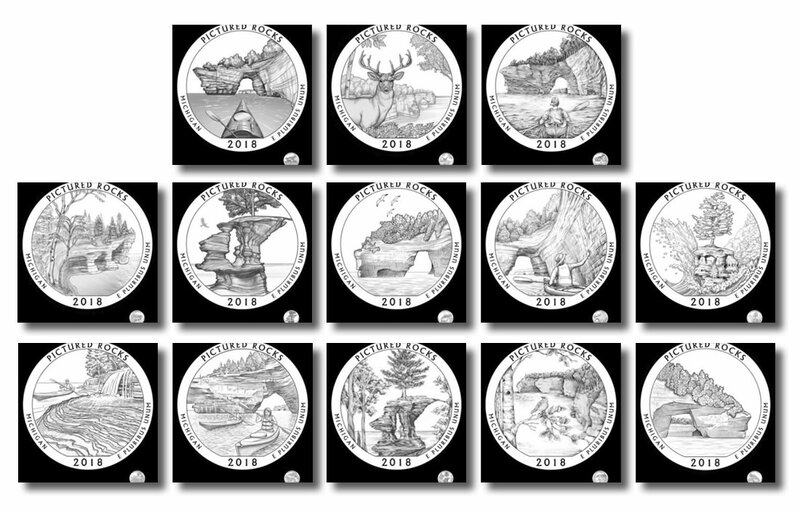 Products containing the first 2018-dated coin from the United States Mint America the Beautiful Quarters® Program launched today, Feb. 5. Featuring Michigan’s Pictured Rocks National Lakeshore, the new quarter is available in quantities ranging from a single 40-coin roll to 100-coin bags. Established in 1966, the United State’s first national lakeshore is a narrow strip of a park that stretches along the Lake Superior coast for more than 40 miles. The shoreline consists of colorful sandstone cliffs, beaches, sand dunes, waterfalls, lakes, and other natural formations. It offers a plethora of outdoor opportunities like hiking, camping, and sightseeing. A total of thirteen design candidates were considered for the quarter’s reverse. From those thirteen, one depicting a scenic view from within the national lakeshore was chosen. The design offers a likeness of Chapel Rock with the white pine tree that grows on top of it. Inscriptions around the artwork include "PICTURED ROCKS," "MICHIGAN," "2018" and "E PLURIBUS UNUM." Artistic Infusion Program (AIP) Designer Paul C. Balan designed the image with U.S. Mint Sculptor-Engraver Michael Gaudioso executing the design for use on coinage. 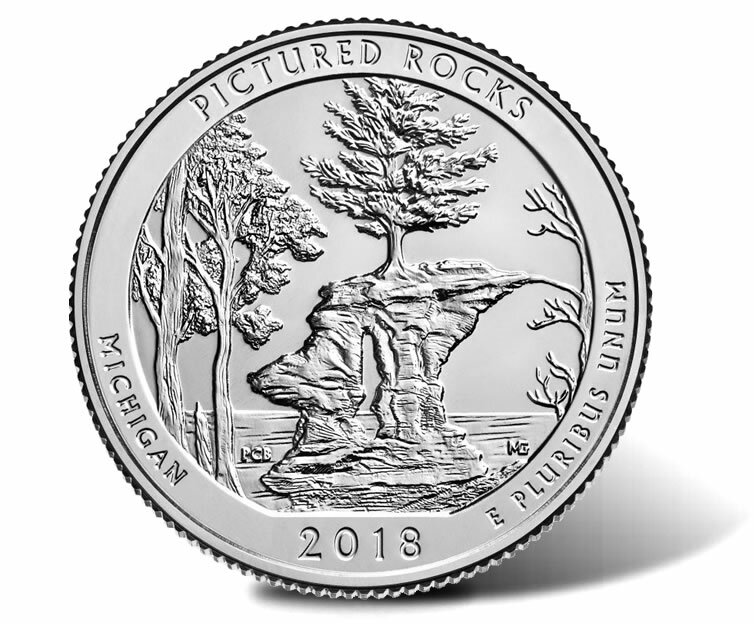 Michigan’s Pictured Rocks quarter depicts Chapel Rock and the white pine tree that grows atop. The quarter is the first of five for 2018. In the following U.S. Mint video, Gaudioso talks a little about his work on the quarter. Adorning the obverse (heads side) of each new quarter is a portrait of the first President of the United States, George Washington. The image has appeared on quarters since 1932. However, for America the Beautiful Quarters, the Mint has stated that the design was "restored to bring out subtle details and the beauty of the original model." Obverse inscriptions read "UNITED STATES OF AMERICA," "LIBERTY," "IN GOD WE TRUST," and "QUARTER DOLLAR." A mintmark also appears on obverses to indicate where they are made with ‘P’ for Philadelphia, ‘D’ for Denver, and ‘S’ for San Francisco. Unlike the quarters from Denver or Philadelphia, those from San Francisco will not be released into circulation. 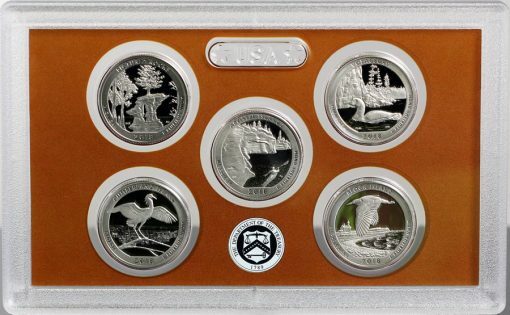 Buy the new quarter rolls and bags directly from the U.S. Mint’s online store located here. They may also be ordered by calling the U.S. Mint’s customer service line at 1-800-USA-MINT (872-6468). An official Pictured Rocks quarter release ceremony is planned for Wednesday, Feb. 7, 2018 at 10 A.M. (ET). The ceremony will be held at Mather Elementary School Auditorium in Munising. After the ceremony, attendees will be offered the opportunity to exchange cash for rolls of the new release. 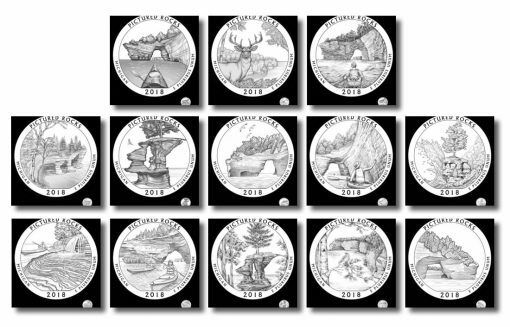 The previous evening, Tuesday, Feb. 6, 2018, a coin forum will be hosted by officials of the U.S. Mint at the Munising Township Office. It will run from 6 P.M. to 7 P.M. The program debuted in 2010 and will run through 2021. By that time, a total of fifty-six quarter dollars will have been issued with one commemorating each state, the District of Columbia and the five U.S. territories. The U.S. Mint also produces three-inch, five-ounce silver coins with designs identical to their companion quarter. They include bullion coins sold through the Mint’s network of authorized purchasers for a premium above their melt value and uncirculated versions for collectors. 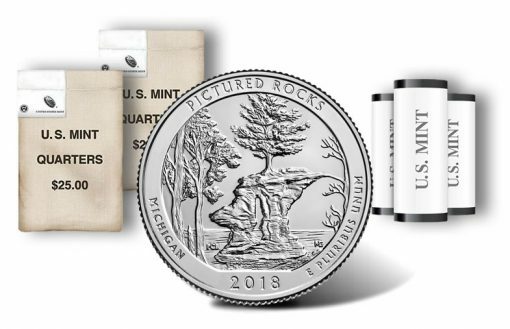 The 2018 Pictured Rocks National Lakeshore Uncirculated Five Ounce Silver Coin is scheduled for release later this week, on Friday, Feb. 9. The U.S. Mint will sell the .999 fine silver coin for $154.95.